Around 25 million packages are delivered in Europe every day and current delivery processes are nearing peak efficiency, with little room left to improve. Now is the time for a logistics revolution! Share your innovative and sustainable solution for improving the last mile of the package delivery process. Unleash your imagination and submit your idea, complete with sketches for the future of package delivery systems by 22 October 2017. The best solution will win a prize of 5,000 EUR! This competition is open to university design students and recent graduates (2017) of an accredited European university. Applicants can apply individually or in teams of up to three members. We encourage multi-disciplinary teams. When competing as a team pick a team leader who will be responsible for the registration and all communication regarding this challenge. Although the competition is focused on industrial design, product design and transportation design, students with a background in business, engineering, architecture etc. are also encouraged to submit their work. Only participants who belong to an accredited undergraduate or graduate university programme or recent graduates (2017), are eligible to participate in the competition. Proof of enrollment (or graduation) will be requested of all finalists. Public voting will also award an exceptional idea with a special People’s Choice Award of 1,000 EUR. Additionally, all winners will have the opportunity to apply for a six-month paid internship at Toyota Material Handling Europe Design Center. 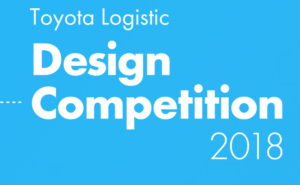 Submit your design concept online at tldc.toyota-forklifts.eu by the deadline 22 October 2017. Following the competition deadline, a panel of industry judges will evaluate all complete submissions and will determine the finalists. Finalists will get feedback from the jury during the beginning of December and a chance to rework their proposals for the final jury session.